If someone asked me to describe Neil Gaiman's Neverwhere in one sentence, I would say "It's the perfect combination of fantasy, horror, and comedy all rolled into one." It's filled with twists and turns that are almost impossible to see coming, and the reader is in for a wild roller coaster ride through every page. Richard Mayhew is just your everyday ordinary businessman trying to make a living in London. On the surface, he seems to have it all, with a beautiful fiance and a successful job. As he is walking to a highbrow dinner one night, he comes across Door, a girl hurt on the sidewalk. While tending to her wounds, he finds himself unwillingly ensconced in Door's world (London Below), a world filled with the highest level of danger and things that are not at all what they appear to be. I was entranced with the fantastical adventures of Door and her friends as Richard tries to make sense of everything he is seeing. 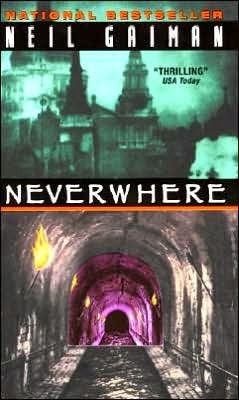 Neverwhere is hard to put down, and it's almost satirical in a way (it remains to be seen if Gaiman meant it like that). At times, you will gasp at the horror of it all, and other times, you'll laugh out loud. I recommend it highly.